The much anticipated roll out of 5G communication networks will be a boon for telecommunications companies all over the world, but it will not come without challenges. The expansion of the internet of things (IoT) and the proliferation of connected devices will almost certainly lead to massive growth in demand for mobile data. New uses like network-enabled automobiles and machine-to-machine communications will add to that demand. Lower latency (5G reaction times are expected to be no more than one millisecond) will open the door for connected devices in time-critical areas like healthcare and smart utilities. Faster speeds will result in higher data rates for users, perhaps as much as ten times higher than 4G capabilities, using the 3.5 GHz frequency bands for area-wide services and the 26-28 GHz bands for high data rate hotspots. Improved connectivity will enable a greater number of connections at once, as many as one million per square kilometer according to some estimates. How will antenna manufacturers, wireless equipment manufacturers, automobile manufacturers and suppliers and wireless operators rise to meet these challenges? As wireless technology evolved from 1G to 4G, the frequency steps were primarily evolutionary — no large technology change or discontinuity was required. The changes required for the antenna were evolutionary as well — antenna technology migrated from an external antenna to an internal one. Band requirements changed from single-band to dual-band, multi-band to multi-antenna, and antenna diversity to multiple-input and multiple-output (MIMO) implementations. 5G implementations, however, provide for up to a tenfold increase in frequencies for some applications. This is a dramatic change from previous technologies, which will provide significant challenges as well as new opportunities. For example, beam forming and beam steering (using antenna arrays) will be possible given that at higher frequencies individual antennas can be much smaller. At these high frequencies, the wavelength (lambda) is around 1 cm, so the device is a multi-lambda platform. This implies that the placement of the antenna becomes much more critical, and replaces the integration aspect key in previous technologies. These more complex aspects of 5G development also make it critical to try out multiple implementations to optimally identify and adjust trade-offs. Altair Feko is a leading comprehensive computational electromagnetics software widely used in the telecommunications, automobile, aerospace and defense industries, and part of Altair HyperWorks multi-physics simulation platform. Because of the higher antenna gain requirements in 5G, typically antenna arrays are needed on both ends, on the mobile device and on the base station. Besides higher antenna gains, more sophisticated feeding and control circuits are needed and a good isolation between array elements must also be achieved. Feko not only includes multiple frequency and time domain methods but it also has a set of features to accurately and quickly design and optimize antenna arrays. A bit more in detail, multiple antenna placement options and their interaction with the hosting board can be easily explored using Feko to quickly identify various trade-offs and optimization opportunities, something too expensive and time consuming to try with actual physical designs. 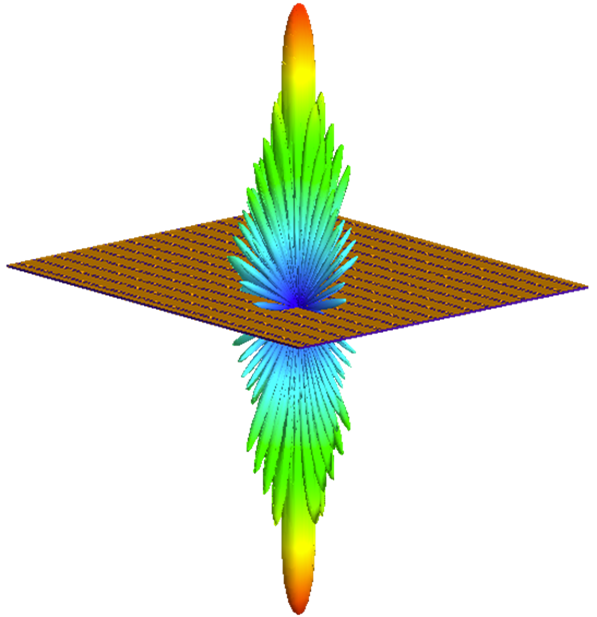 Even complex beam forming and steering capabilities and their efficiency at different frequencies can be simulated and results easily viewed in 3D models, such as the one shown below, a 2D 16 x 16 antenna array, working at 26 GHz. Figure 1. 2D 16 x 16 antenna array for 5G base station working at 26 GHz designed and optimized with Feko. The new 5G cellular technologies will provide consumers with data rates of up to ten times that of previous 4G/LTE. A similar trend towards higher data rates by using higher frequencies is visible for Wi-Fi implementations exploiting the 60 GHz band with standards 802.11ad and 802.11ay. For these new technologies, achieving the desired network performance in urban and indoor environments creates new challenges. Performance will depend strongly on the radio channel (and the associated frequencies used) which the urban and indoor building structures will impact. High-accuracy wave propagation models are required, for channel statistics as well as for predicting and optimizing radio coverage. Coverage needs to be analyzed for different base station deployment scenarios, different frequencies and different environments and along different test drives. This level of testing can be difficult, time consuming and expensive, but if not adequately explored, even more expensive quality issues and the associated redeployment cost could occur. Too much time taken in testing, however, can delay market entry and reduce profits. Somehow, the right balance needs to be achieved. Figure 2. A 5G radio coverage simulation in an urban area considering multiple base stations using WinProp. Complementing Feko, Altair has WinProp software which provides a complete set of tools for defining and modeling wave propagation in a variety of environments and situations important for 5G-based devices and systems. WinProp’s highly accurate and fast empirical and deterministic propagation models cover a wide range of scenarios, from rural to urban as well as indoor, tunnels and even hybrid environments. The realistic wave propagation models allow the successful deployment and optimization of the evolving radio access networks as well as to create a virtual testbed for product trade-off analysis including the antenna effect. In 5G networks, predictions for both coverage and interference are key to judge about the capacity. WinProp allows users to simulate, being computed individually for each transmission mode, maximum received power and achievable data rates for each location in the area of interest. Capacity limitations and overloaded cells are easily detected and networks can be optimized to provide both coverage and high throughput. Capacity improvements due to MIMO or beam forming are accurately modeled because of WinProp’s sophisticated deterministic propagation models. The developer can even import Feko antenna patterns into the WinProp simulation. The illustration below shows how the Feko-generated pattern for an outdoor, three-sector antenna is imported into WinProp and analyzes radio coverage in an urban environment. This capability dramatically speeds-up the modeling, allowing multiple implementation cycles to optimize product characteristics. Figure 3. 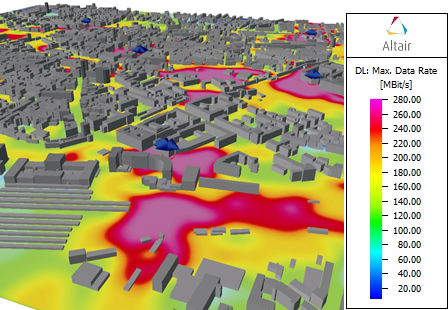 Combined use of Feko and WinProp in a 5G urban environment coverage simulation. The transition to 5G will be a revolution for consumers and will also require technological innovations for antenna design, base station configuration, and network deployment. Software tools such as Altair’s Feko and WinProp are being and will be key elements in developing successful 5G products and networks, as you can also read in this article from Kathrein in Germany about their testbed for LTE and 5G.